Our plastic Gift full color plastic cards or (PVC) cards are printed on high quality gloss PVC plastic and are standard CR80 size 3.37 x 2.125 inches in size and 30 MIL 0.03 inches thick. Our Gift cards can be used and programmed to work with all your POS systems or we can provide them with Lo-Co magnetic stripe or Hi-Co magnetic stripe programmed or not programmed based on your specifications, we offer one (1) track magstripe, standard two (2) track or three (3) track magstripes. Barcodes are also available depending on your needs. Optional Matte, clear, metallic, etc. are available at additional cost. Thinner plastic cards 20 MIL and 15 MIL are also available. We print four (4) color process and print full color both sides. Pricing starts at $229.00 for our minimum print of 500 gift cards and turnaround times are 6-8 business days plus free air overnight shipping. 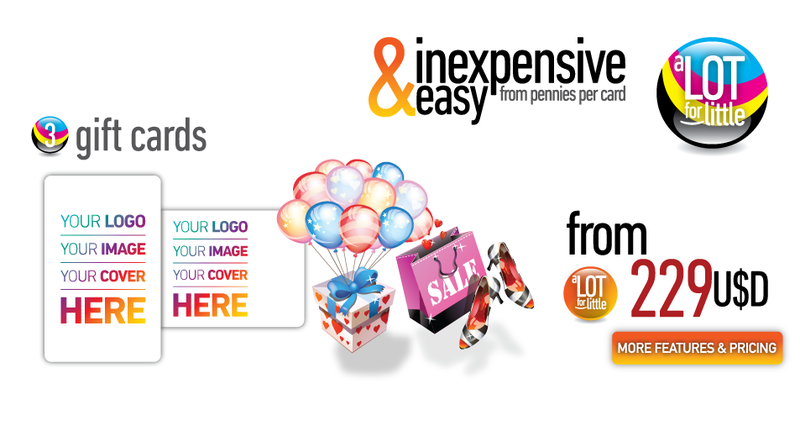 Our plastic card printing is of the best quality and we also offer a Rush option for additional fee. Just place the order and upload your artwork, if you need assistance with your artwork we also offer free professional design. Once we get your artwork you will get a preliminary proof then once you approve we will proceed with the printing process. You should get your gift cards in 6-10 business days unless you opted for the Rush service which will take 5-7 business days.